The JBoss Enterprise SOA Platform server is launched in Window1 and then the FirstServiceESB:SimpleListener service is added to the Service Registry service when the helloworld quickstart is deployed. A JMS client sends an ESB-unaware "Hello World" message, (it is a plain String object), to the JMS Queue (queue/quickstart_helloworld_Request_gw). The JMS Gateway Listener receives the ESB-unaware message and creates from it an ESB-aware message for use by ESB-aware end-points. The JMS Gateway Listener uses the service registry to find the FirstServiceESB:SimpleListener service's end-point reference (EPR). 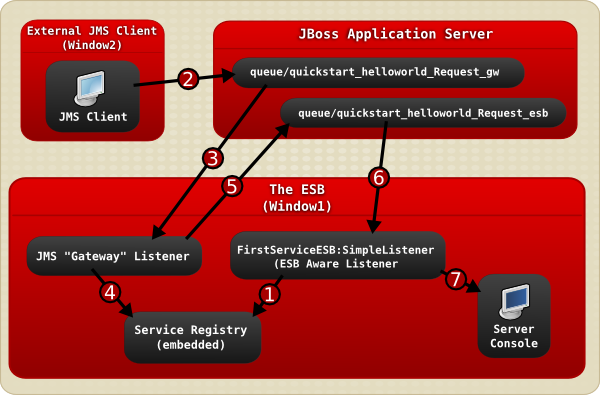 In this case, the EPR is the queue/quickstart_helloworld_Request_esb JMS queue. The JMS Gateway Listener takes the new ESB-aware message and sends it to the queue/quickstart_helloworld_Request_esb JMS queue. The FirstServiceESB:SimpleListener service receives the message. The FirstServiceESB:SimpleListener service extracts the payload from the message and outputs it to the console.